Those who have at least once tried volunteering understand how much it can give at a personal and professional level. For Latvian seniors volunteering is not every day, but step by step it becomes more important. During Senior Plus project seniors from Gulbene, Tirza and Druviena did a lot of different tasks, which gave them large experience. 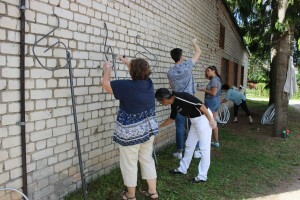 Our seniors were helping to prepare to different kind of local cultural events and festivals, they cleaned youth center warehouse, Old Gulbene Manor Park, river shores in Jaungulbene village and church. Some of them worked in library and helped elderly people. They all recognized that volunteering helps to improve communication skills and gain new friends. They become more opened to new things and experience. Posted in: Notizie Senior-Plus This entry was posted on Monday, July 31st, 2017 at 4:07 pm You can follow any responses to this entry through the RSS 2.0 feed.